Arachis diogoi, a wild diploid species related to the cultivated peanut, is resistant to the late leaf spot pathogen Phaeoisariopsis personata, which is one of the causative agents of a disease collectively termed as “Tikka disease” in the cultivated peanuts. The wild relatives of cultivars of agricultural importance have always been explored for their rich and diverse gene pools. In our quest to identify paralogs responsible for biotic stress tolerance, we have developed data on the differentially-expressed genes and proteins present in A. doigoi when compared with A. hypogea. Previously, we have characterized genes like Cyclophilin, Suppressor of g2 allele of skp1 (SGT1), Vacuolar processing enzyme (VPE), serine/arginine-rich splicing factor (AdRSZ21), and others which have roles in enhancing disease resistance in the heterologous system, Nicotiana tabacum, thereby showing the rich biotic, stress-responsive gene pool of A. diogoi. Apart from the genes responsible for increasing resistance towards fungal pathogen, we have identified those genes that have the capability to augment abiotic stress tolerance such as AdLEA, indicating that a defense response in A. diogoi is a result of the molecular overlap between recognition and signaling pathways that regulate abiotic and biotic stress tolerance in plants. An upregulation of defense-related transcripts for combating biotic stress tolerance is as important as ensuring proper growth and development of plants under stress. Defense response in plants is a cumulative effect of activation of several molecular pathways, not just one. There are several examples in the literature where we could see that defense occurs at the cost of plant growth and development. For example, srfr1-4, a mutant lacking SRFR1 (Suppressor of RPS4-RLD1) in Arabidopsis thaliana, exhibits avrRPS4-specific disease resistance independent of RPS4 with constitutive expression of R gene SNC1 and shows a dwarf phenotype. A similar type of phenotype is observed for bon1 (BONZAI 1) mutant in A. thaliana. Under stress conditions, a misbalance in protein homeostasis arises as a result of improperly-folded proteins. This leads to non-functional stress-combating molecular machinery. Chaperones play a significant role in rescuing cells under stress while maintaining protein homeostasis. Accordingly, plants have developed an array of molecular pathways to evade stresses by increasing the pool of molecular chaperones. Molecular chaperones interact with diverse protein substrates to assist their folding and to prevent accumulation of misfolded or otherwise damaged non-functional protein molecules. DnaJ proteins, also known as Heat shock protein 40 (HSP40), are a family of conserved co-chaperones for HSP70s. DnaJ/HSP40 proteins determine the activity of HSP70s by activating ATPase and also providing them substrates to act upon. They can bind both folded and unfolded protein substrates, thus promoting reactivation of proteins damaged during different stress conditions and facilitating the proteolysis of abnormal proteins. The pool of transcript derived fragments differentially expressed in A. diogoi when compared with A. hypogea upon fungal infection not only lists an upregulation of defense-related transcripts but also transcripts responsible for maintaining protein homeostasis and metabolism inside a cell. This suggests that defense in A. diogoi is not a result of overproduction of just R proteins, but that there are proteins like AdDjSKI, present in chloroplast, which maintains protein homeostasis and ensures proper functioning of photosynthetic machinery. A plant’s photosynthetic machinery in chloroplast is usually under threat of elevated ROS levels and is also under the demand of making more energy to survive in a stress condition, and, hence, it must perform well for the survival of the cell. Pathogens are seen to release effector molecules to disrupt the normal functioning of a plant cell. These effector molecules often have a signal for their translocation to either the chloroplast, nucleus, or other cell organelles; accordingly, plants have learned to recognize these effectors and combat with invading pathogen by producing resistance (R) proteins. One possible explanation for multiple abiotic and biotic stress tolerance observed by overexpression of chloroplastic AdDjSKI can be that it protects the photosynthetic machinery of plants from elevated ROS levels as seen in form of transcriptional upregulation of antioxidants under heat stress and reduced ROS levels in response to salt stress in transgenic lines in this study, thereby ensuring proper functioning of chloroplast even under stress conditions. This explains the phenotype observed in the form of multiple stress tolerance observed in overexpression lines as a result of a generalized stress response, occurring due to normal functioning of chloroplast and trans-passing of a retrograde signal from chloroplast to nucleus, aiding transcriptional reprogramming under a stress condition. AdDjSKI overexpression lines showed multiple stress tolerances, which were associated with transcriptional upregulation of several stress-responsive transcripts including HSP70s, antioxidant enzymes under heat stress, and PR genes in response to fungal infection. Something which was very interesting to observe was that these overexpression lines exhibited normal growth and development as WT, as evident from the growth of seedlings under control conditions; even plants in a greenhouse all looked alike. Looking at the phenotype observed w.r.t overexpression of AdDjSKI, it seems to be a good candidate for deployment in crop plants. 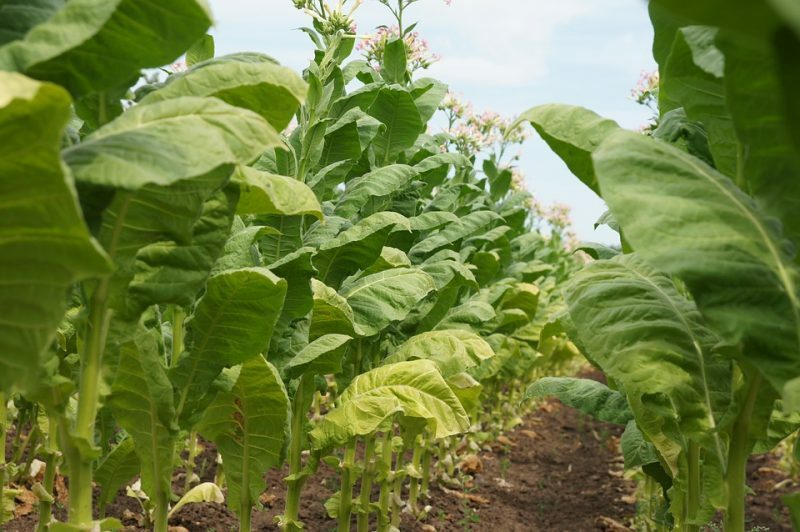 These findings are described in the article entitled Pathogen-induced AdDjSKI of the wild peanut, Arachis diogoi, potentiates tolerance of multiple stresses in E. coli and tobacco, recently published in the journal Plant Science. This work was conducted by Sakshi Rampuria, Pushan Bag, Akanksha Sharma, and P.B. Kirti from the University of Hyderabad, and Conner J. Rogan and Walter Gassmann from the University of Missouri, Columbia. Sakshi Rampuria is a research scholar at Hyderabad University in the Department of Plant Sciences. Her areas of expertise are gene expression, DNA analysis, molecular genetics, genetic engineering, and cloning.